In subsequent years history tells us that too often participants of various student social movements have not adhered to such utopianism with a staccato of misplaced optimism tinged with moments of euphoria and delusion. These moments pierced a move – marked most keenly since the end of the 1970s – towards a general apathy among students towards political contention and to the ability of the student movement to effect a tangible impact on public policy outcomes and our national political discourse. In the last few weeks, however, it seems that the narrative might be changing and that the student movement and young people more generally are, for the first time in decades, recognising their ability to impact policy outcomes and exercise political agency. Such individuals are keen to have their voices heard and increasingly certain that a politics of the streets, of occupations, marches and petitions will perhaps have an impact on the final implementation of the coalition’s plans for education reform, be it in the form of a move in stance towards the Educational Maintenance Allowance, stopping any potential increase in higher education fees or finding a progressive compromise on the proposed 80 per cent cuts to the higher education teaching budget. But away from ideological conjecture and the seemingly new found political agency of Generation Y there have been interesting developments with regard to the appropriation and use of social networking tools by disparate movements ‘on the ground’ in collaborating and ‘co-producing’ a mass movement that may be the first, in Britain at least, to be organisationally dependent upon the tools of Net 2.0. While the Stop the War movement was heavily dependent upon the old tools of mail and television it was also founded upon the organisational structure of a single ‘movement’ with a hierarchical leadership and mass membership. With the advent of this embryonic student movement, however, we are arguably seeing the rise of a form of contention predicated upon values of disintermediation and decentralised, entrepreneurial action undertaken by participants as ‘co-creators’ of the movement as opposed to members-as-consumers who are directed to act by an organisational oligarchy. Occupations and demonstrations are occuring all over the country, and while the aims and objectives are broadly similar, the means that will be utilised will vary subsequent to the innovative efforts of ‘dissent entrepreneurs’ embedded within their different communities. It is in this area that political parties might learn a great deal about how to run a political campaign fit for the 21st-century over the coming months. The logics of social movements in the twentieth century will look more like the irreverent, flexible ‘culture-jamming’ of the recent Vodafone protests and less like the top-down hierarchy of the Stop the War campaign. Expect similar actions to those of the Vodafone protests to occur over the coming weeks with occupied spaces acting as local incubabtors for like-minded progressives to discuss and plan direct action that is relevant and compelling for their specific communities, always heeding a meta-narrative that is against the government’s position on tuition fees. What these new logics mean is that established oligarchies within existing movements, such as the National Union of Students, will be increasingly undermined – that is the nature of the de-centred beast in networked activism. What is key, however, is that for the first time in 40 years we have a generation of young people actively participating in political deliberation and direct action, all along forming links, networks and friendships as well as learning about theory, strategy and areas of mutual interest. It is these networks, friendships and this mutual education that will form the basis for any prospective movement for progressive change in this country, just like the events of ‘68 did for subsequent generations of feminists and gay rights activists. For a whole generation the events of recent weeks are the beginnings of a progressive political education and for that at least the Labour Movement should be happy. After all, one only has to go on Twitter to see that #solidarity is trending. The mood music is decisively shifting left and the tools of the information age and Net 2.0 mean even the little guy on the street can really turn up the volume. 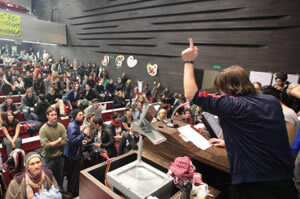 @timeshighered the best accounts from inside the UCL Occupation are here guys http://bit.ly/hOObNp and http://bit.ly/ehUWCC! http://bit.ly/ehUWCC "#solidarity is trending" the new "Maggie, Maggie, Maggie, out out, out"
@AnthonyBarnett a piece I recently wrote on some of the social media themes your OD piece touched on http://bit.ly/ehUWCC 69. No Aaron that’s not true, STW and the Anti-Capitalist movement before it, both used grassroots and internet to organise, maybe you’re not old enough to remember but at it’s height in 2002/3 STW was a mass movement of people all over the country doing stuff–including the biggest day of direct action up till then in the UK–the 2 million brought out onto the streets didnt come through central diktat, but because there were strong local groups all over the country. You also seem to underestimate the role of leadership even in this student movement, however low-level. But that’s a far deeper problem and it’s late!